We are proud to announce that Heritage at Vista Del Verde Homeowners Association has selected Tinnelly Law Group as their association’s legal counsel. 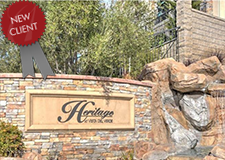 Heritage is a luxury townhome community located within the master planned community of Vista Del Verde in Yorba Linda. Adjacent to the 18-hole championship, Black Gold Golf Club, residents enjoy opulent common areas, pool and barbecue area. Our HOA attorneys and staff look forward to working with Heritage at Vista Del Verde’s Board and management.